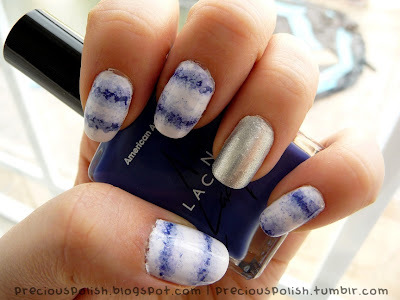 precious polish: Nails "Tie-Dye" For! Haha, get it? Nails to die for? No? Okay, moving on! I've had this idea in my head for awhile and I finally did it last night. Navy blue tie-dye is one of my favourite trends right now. I think I got the effect down but the pattern/placement could be better for more of a random tie-dye look. It reminds me a bit of those white china plates with the blue detailing. I used Sally Hansen Complete Salon Manicure Lavender Cloud as a base with American Apparel L'Esprit and American Apparel Mount Royal for the pattern. The accent nail is Barry M Silver layered over Sally Hansen Complete Salon Manicure Lavender Cloud.